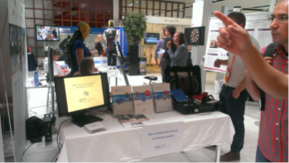 During the ECSS conference in the RAI in Amsterdam from 1st to 4th of July 2014, we showed a presentation about the ANDREA project on a dedicated monitor on one side of the ANT Neuro booth. It was directed at one of the exits of the main auditorium (max 800 attendees). At the same time it was located near a coffee corner. As such, the presentation gained moderate attention of passersby as can be seen in the pictures below. 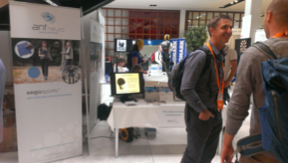 We had a lot of interaction with people who were interested in ANT eegosports at our booth. The number of serious leads far exceeded our expectation which expressed our feeling that EEG in sport science will be the next big thing. In about 20% of these conversations prospects asked about dry electrodes in which case the ANDREA presentation was shown to them and we explained them about the project and our role in it. We got the impression that there is serious interest for the finished dry electrode and that it could be a worthwhile addition to the usage of mobile EEG in sport science and related areas.